If you haven't guessed, I'm kind of sick of writing about the Tappan Zee Bridge at this point. But I'm jumping back into the fray because there are some issues that need correcting. I asked nicely on Twitter, but people don't seem to have picked up on it, so I want to go into detail. If you follow the official "Build the Bridge Now" Twitter feed (kind of boring, because much of it is the same seven or eight tweets over and over again), you'll be treated to a number of dishonest claims that are commonly repeated by highway departments all around the country. They're big deals, and someone should really talk about them, but they're not big deals for this project, because everybody does it. They're also possible to weasel out of because they're technically true, but missing some critical bit of information. Here I'm talking about claims that the bridge carries more than it was designed for (the State let those cars on), that the lanes are too narrow (the State narrowed them in 1990) and that it will create thousands of jobs (there are plenty of ways to put thousands of people to work). There's a more serious claim being made, one that is demonstrably untrue. That is that the Tappan Zee Bridge is structurally deficient. "Structurally deficient" is a big claim. It means that there is something wrong with the structure of the bridge that makes it more likely to collapse suddenly and dump a bunch of cars into the river. It is distinct from "fracture critical," which means that one failure can make the whole bridge collapse. It is also different from seismically unfit, which means that an earthquake could do more damage to the bridge than the engineers are comfortable with. Finally, it is not the same as "functionally obsolete," which is just a fancy way of saying that a bridge doesn't carry as many cars as the engineers want it to. The Tappan Zee Bridge is fracture-critical, seismically unfit and functionally obsolete, but it is not structurally deficient. The difference is important, because "fracture critical" and seismically unfit talk about what could happen if there is an earthquake or a fracture. "Structurally deficient" talks about how likely a fracture is. "Functionally obsolete" just talks about how many cars can fit on the bridge. Don't get confused like Andrea Bernstein did. When the "structurally deficient" claim is just coming from the "Build the Bridge" Twitter feed, or Car and Driver Magazine, you can kind of dismiss it as basic partisan hackery. But lately, this claim has been repeated by ostensibly neutral news sources like the New York Post (yeah, I know, but it has also posted some good critiques by Nicole Gelinas) and CBS News. I was most disturbed to hear it show up on a program that I actually listen to for my own interest, National Public Radio's Science Friday. I was kind of grumbling as I listened to their segment on Time To Overhaul America's Aging Bridges? and thinking that they really should have had Strong Towns' Chuck Marohn on. And then host Ira Flatow asked, "What is the worst bridge in America?" Flatow's guest, Barry LePatner, replied, "You talked about the Tappan Zee Bridge. It is a bridge that carries 140,000 vehicles a day. New York state - the New York Thruway Authority, which manages that bridge, pays $100 million a year to keep it afloat. It is structurally deficient. It is fracture-critical just like the I-35W. And while they're planning to build a new bridge nearby, it's still going to take many years. The risk to every driver who goes over there every day is tangible." And it turns out that all of these stories - Science Friday, "Build the Bridge," Car and Driver, the Post and CBS News - all get the claim from LePatner. 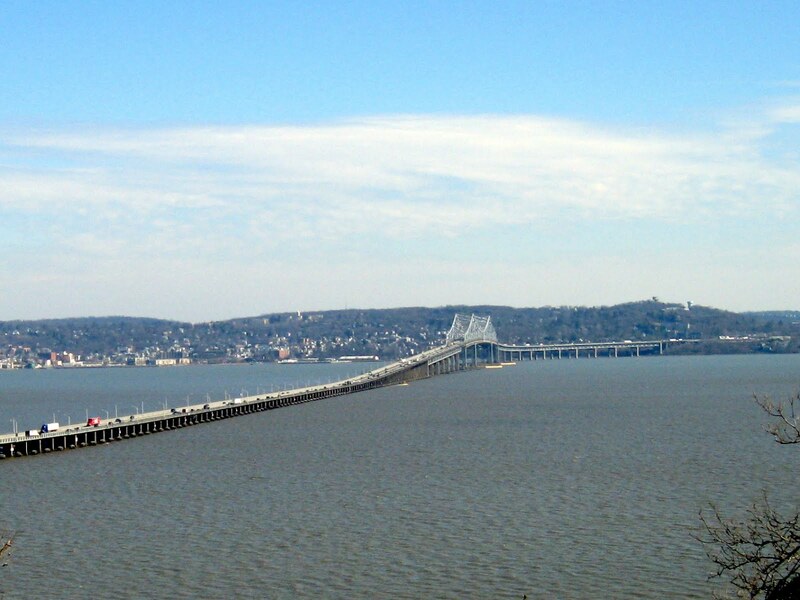 The Tappan Zee Bridge is simply not structurally deficient. Here is the 2011 National Bridge Inventory report for the Tappan Zee Bridge; you will see that under "STATUS" it is listed as "Functionally Obsolete." That is not the same as "Structurally Deficient." If you don't believe "nationalbridges.com", you can see that it is not on this list of structurally deficient bridges in Rockland County from the federal Bureau of Transportation Statistics. If you look at the list of Rockland County bridges on this PDF from the New York State Department of Transportation, you'll see that it is listed as "Functionally Obsolete," not "structurally deficient." Now, this is the 2011 National Bridge Inventory, and LePatner's website and book are based on the 2009 database. Maybe the bridge was listed as structurally deficient in 2009, but taken off the list in 2011? Unfortunately, the only copy of the 2009 database I can find is in a pretty hard-to-read form, but it seems to me to be saying that in 2009 the bridge was rated as neither structurally deficient nor functionally obsolete. In any case, in general the database is not the most reliable. And it's certainly not a suitable basis for any kind of coherent infrastructure policy. As I wrote a year and a half ago, not all infrastructure is worth replacing. Of course, it is a suitable basis for building the career of Barry LePatner, construction lawyer, and there's nothing really wrong with that. We just have to consider the source, and I think Flatow could have shown a lot more skepticism. But why did LePatner say last week that the Tappan Zee Bridge was structurally deficient? If the bridge was listed in 2009, I could see why he would have put it in his book. And I can understand that a lot of work went into his book and map, and he doesn't have the resources to update it for the new database. Still, this is LePatner's major case, and he's been in four major news outlets this summer, specifically focusing on the Tappan Zee Bridge. Surely he knows that there's a new National Bridge Inventory - didn't he check to see the Tappan Zee Bridge's status before repeating this claim? Maybe not - if it was on the structurally deficient list, have they done enough work to take it off? Could somebody be paying him to spread this claim? Maybe, but I think the promise of future business for his firm is enough explanation. Intentionally or not, LePatner is spreading misinformation. I hope that all the news outlets involved - Science Friday, CBS News, the Post, Car and Driver and even the PR flunkies who manage the "Build the Bridge" Twitter feed - check the facts. Don't listen to me; I'm just some anonymous blogger! Go to the source, and then publish your corrections. To balance out that entirely too credulous "OMG! Bridges collapsing!" segment, I hope that Science Friday will run a more skeptical discussion in the future. Obviously no segment on infrastructure policy is complete without Strong Towns' Chuck Marohn, renegade civil engineer. "Engineer Scotty" Johnson in Portland is fighting his own Tappan Zee boondoggle, the Columbia River Crossing. Alon Levy, mathematician by training, has attracted a following with his incisive comments on transportation infrastructure. If Flatow really wants to go for entertainment value, he could bring on Jim Kunstler who will tell the audience that all the bridges will collapse within the next hundred years. Kunstler's former podcast host Duncan Crary has been doing interesting collaborations with the crew of an Erie Canal freight tugboat. I emailed Science Friday last Thursday asking for a correction, but I have not gotten a response yet. You can contact them at scifri@sciencefriday.com. In the meantime, please spread the word on your own blogs, Twitter, Facebook, chapbooks, town criers, semaphore, whatever it takes. I understand that you are taking issue with the particulars of word choice here and the distinction is important. That being said, whether it’s functionally obsolete or structurally deficient, neither of these things is good. I do not think it was originally designed properly for seismic (earthquake) loads. While this is not as important as if the bridge were in California, New York is seismically active and this bridge has a higher chance of structurally failing in an earthquake than a new bridge. Just because the bridge is perfectly safe to drive on during a normal day doesn’t mean we shouldn’t replace it with something safer. If Cuomo’s plan were changed and the existing Tappan Zee stays, it would have to undergo a huge retrofit that would be much more intensive than replacing the suspension cables on the GWB. 2. How can a bridge that is not "structurally deficient" be "fracture-critical"? 3. There seems to be a number rating in addition to the structural deficient and functionally obsolete category. What is this? 4. To @AlexB's comment, what is the formula used to determine whether or not to replace a bridge based on seismic loads? People also tell stories about chunks of bridges falling off. Can these things (like a hole in the roadway) and still have a bridge not be structurally deficient? Thanks, guys! I updated the post to clarify the differences between "structurally deficient," "fracture critical" and seismically unfit. Alex, I'm not saying the Tappan Zee should stay, I'm saying it should be torn down. But even if it is seismically retrofitted, that would be cheaper than replacing it, and even if it's replaced, there are cheaper replacement options. Amateur, as I understand it, a bridge can have humungous car-sized holes all over its roadway and still not be considered structurally deficient. I don't know what the number ratings mean, but if you post a link I'll take a look. 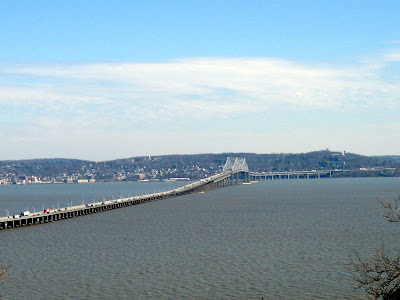 Wouldn't it still be cheaper to move the bridge to the south or north end of the Tappan Zee? Even *with* the new roadway construction involved? Sigh. The bridge is in a *stupid* location. Here's the link, Cap'n. I'm near a local bridge on Ashford Avenue in Ardsley that is considered Structurally Deficient. After the category, there is a number rating. I thought this list had the TZ Bridge, but now I can't find it. Must be confusing the two bridges.